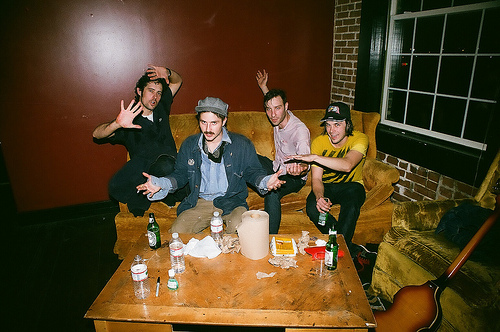 We got another taste of the upcoming Mark Ronson-produced Black Lips record, Arabia Mountain [slated for release this June from VICE] And we gotta say, I think this one has us more excited than the last. It’s a bit strange to hear the Black Lips so cleaned up and polished, but that’s what we’ve been prepping ourselves for since we heard they were working with Mr. Ronson. If the track isn’t as classic-Lips as you’d like it to be, the video at least holds true to the Black Lips aesthetic of drugs and dive bars and crazy stuff and grills. You know. Check it out down there. Arabia Mountain comes out on June 6th and Black Lips are doing a bunch of dates with Vivian Girls now. No word on a Nashy date yet, but we’re sure they won’t ditch us.